Container gardens full of summer annuals are a great way to enhance an established outdoor living space or landscape. Whether you’re simply looking to add a fresh pop of color or something more elaborate, container gardens are a versatile way to accomplish your goal. Here’s our 5 favorite ways to use container gardens in the landscape. First impressions happen within the first 15 seconds of meeting someone, and the same is true of seeing a property or landscape for the first time. Container gardens are a fantastic way to ensure homeowners are sending their guests the desired message. 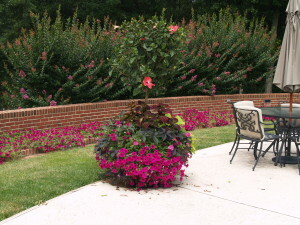 In the picture below, we blended annuals that had bright red, pink, and purple colors to create a sense of warm invitation, and used hibiscus trees to add a touch of formality that complimented the home’s stately architecture. Frame a doorway with attractive container gardens to create an inviting entry for visitors. Fun fact: Many marketers believe that individual colors can be used to nonverbally communicate different meanings and evoke emotions – what message do you think your landscape is broadcasting? Defining a boundary or creating privacy in a landscape can be as simple as lining up your favorite planters for the summer. Container gardens offer a cost effective way to define boundaries in our outdoor spaces in a non-permanent way. Here’s a great example of container gardens being used to define a space. This homeowner wanted to create a sense of privacy in their small backyard, but they also wanted to preserve the feeling of openness. Our solution was to create a visual boundary using a tall, potted tropical and offsetting it with annuals that were shorter but that had more fullness, in this case different cultivars of coleus. This planter utilizes many colors found throughout the home’s landscape, helping to create a transition into the poolside space. 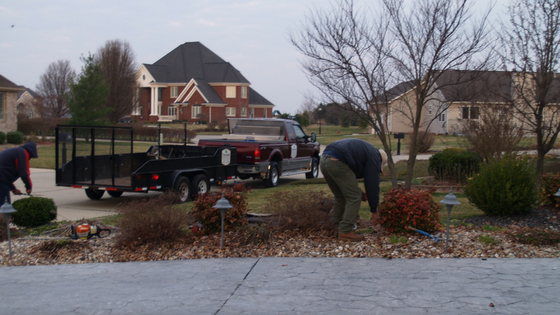 With the right plant selections, the same containers that were used to highlight or define a boundary can be used to soften them – effectively transitioning between different outdoor spaces. 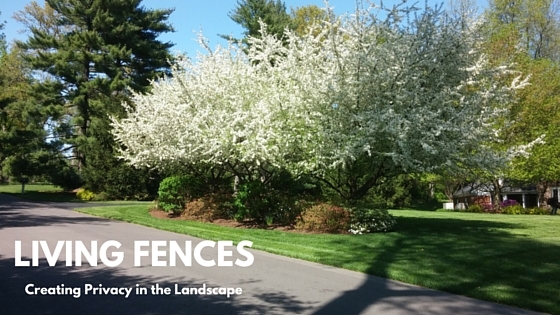 This is especially useful in smaller yards where homeowners desire to achieve a sense of airy, open space. 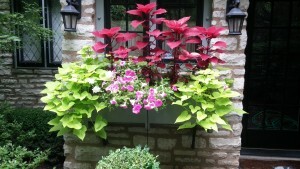 Draw the eye with a bit of color or a unique planter – this window box helps visitors to find an unobtrusive side door. Creating a focal point is a fantastic way to direct attention and traffic where you want it most in the garden or landscape. Here, a homeowner effectively draws guests down a small pathway to discover an unobtrusive side entrance with the help of a window box full of colorful annuals. In this case, the bright reds and pinks are particularly eye catching because the surrounding landscape is predominantly green. 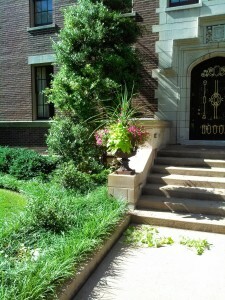 A container garden that uses contrasting colors and textures makes a statement by this front entrance. contrast with the surrounding landscape. Here, an ornamental urn is planted with petunias and sweet potato vine in colors that aren’t found anywhere else on the property. To create eye-catching container displays, try to pair at least one plant that provides a bit of height and drama with something that will fill in the space around it, and a third plant that will spill over the side. Looking for inspiration? Check out some of our favorite container gardens on Pinterest! 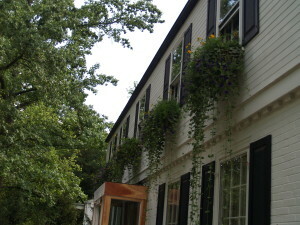 Window boxes filled with trailing vines and brightly colored flowers breaks up an otherwise plain front exterior. Break up otherwise bland spaces and building facades by playing with color and texture. 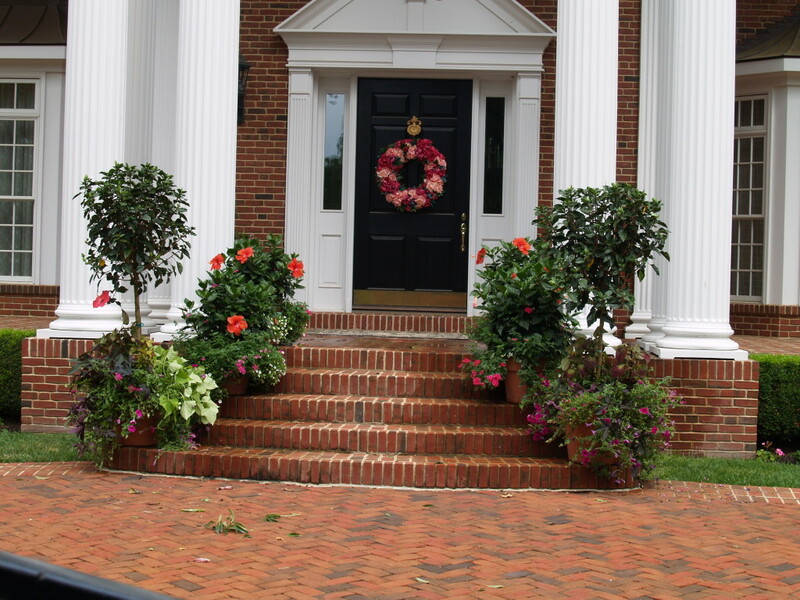 This homeowner used trailing ornamental vines and brightly colored flowering annuals to add a sense of depth and interest to the front of an otherwise flat home front. Another effective method we’ve utilized is pairing large planters with attractive trellises and climbing plants. 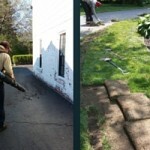 This is particularly useful for breaking up large spaces of blank walls around patios, but can be used in any area. Mandevellia in particular are an ideal climbing plant to train onto trellis, and will provide vibrant arrays of red or pink blooms all summer long when cared for. 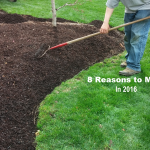 Choose your soils wisely to keep plants healthy and watering needs reasonable throughout the summer months. 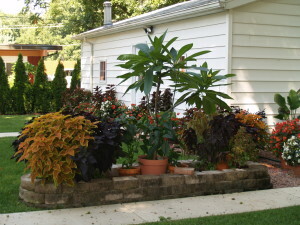 Stop by U of I’s article: Successful Container Gardens: Using Soil and Soil Mixes to learn more. 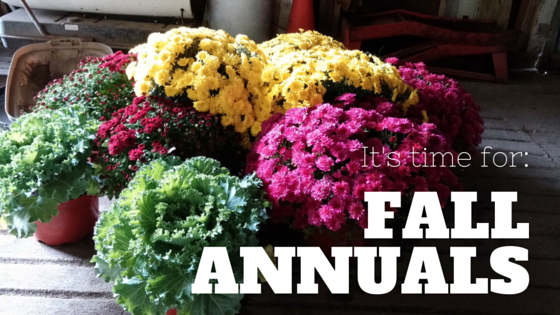 Know what effect you want to achieve before you start planting, and plan accordingly. Planters that are taller or are filled with colors that contrast with their surroundings tend to draw the eye and stop traffic, while smaller planters with complimenting colors will pull the eye through a scene. Avoid mixing too many different colors and styles of containers, as this can give outdoors spaces a cluttered or confused feeling. Experiment with color and texture combinations. One of the biggest benefits to container gardening is the ability to change your style or theme from year to year. Get inspired with a little bit of Color Theory. Have a plan for moving containers that live on your porch or patio in the event ne of your guests is highly allergic to bees. Questions, comments, or concerns? Stop by our Facebook page – we’d love to hear from you!